The Surgeon General in partnership with Fitbit has issued the Step It Up! Challenge open to all Americans, running from October 13, 2016 at 12:01 AM PDT and ends on October 26, 2016 at 11:59 PM PDT. The idea is to encourage people to walk more to improve health and raise awareness about making cities more walkable. You can sign up here and join my team, Happy Healthy Nonprofit. 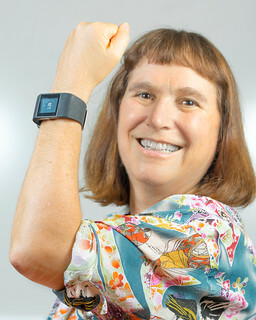 Part of the inspiration for the Happy Healthy Nonprofit c0-authored with Aliza Sherman came several ago when I strapped on a Fitbit three years ago to improve my health after getting news from my doctor about high cholesterol numbers. She said even if you started walking 20 minutes a day, it would help. Well, I started slowly, with a 1,000 or steps a day, but gradually increased it. After six months, I brought my numbers down into the normal range without medication. And, after three years, I’m up to 15,000 steps a day and have lost a great deal of weight as you can see with my headshots below. But something else happened, I was actually happier – and more productive at work. So, walking has become a regular part of work day. It is part of getting the work done! But don’t take my word for it, the Surgeon General’s Step It Up Call To Action page includes a good summary of all the medical research and benefits of walking to individuals and to entire cities. Strong evidence exists that physical activity has substantial health benefits. People can get these benefits through brisk walking or by adding brisk walking to other physical activities. Walking is an excellent way for most Americans to increase their physical activity. Walking does not require special skills, facilities, or expensive equipment and is an easy physical activity to begin and maintain as part of a physically active lifestyle. People walk for many purposes, such as for transportation to get to school, work, a store, or the library or for leisure to have fun, socialize with friends or family, walk their dog, or improve their health. Because walking is multipurpose, it provides many opportunities for people to incorporate physical activity into their busy lives. Communities can benefit when they implement strategies that make them more walkable and when more people walk. Communities designed to be walkable can improve safety not only for people who walk but for all community members. Walkable communities and communities where more people walk offer opportunities for personal interaction and social involvement. Communities designed to be walkable have the potential to reduce air pollution and greenhouse gases because people may choose to walk or bike rather than drive. Finally, walkable communities are attractive places for businesses to locate, which may help local economies thrive. What are you waiting for? Step It Up now!